Place the brain in the charger plugged into a USB outlet (a wall socket is preferable). The LED will flash green to indicate the brain is charging and turn solid green when full. Dampen the sensors in the Smartlife garment (the silver areas on the inner surface) and put the garment on, ensuring a snug fit and that the sensors are in direct contact with your skin. With the 3 dots pointing to the right of your body, insert the brain into the pocket on the garment. For help on inserting the brain, view this video. Tap firmly on the lid until the LED turns blue or red (depending on the level of charge). The brain will sleep after 2 minutes of inactivity. Install and open the Smartlife app. Tap < CREATE ACCOUNT > and follow the on-screen instructions to set up your user profile. The next time you open the app you can simply log in with the username and password you set. Tap < CONNECT BRAIN > and follow the on-screen instructions to pair your brain. Available brains will appear in a list. If more than one brain is present and active, tap on the ID that matches the brain you are using. Tap < ACTIVATE SENSORS > and stand still while you wait for your signals to be detected. Once successful you will be directed back to the hub where your heart rate and breathing data will appear. The signal quality indicates the connection strength between the sensors and your skin. It is affected by the amount of moisture in your skin and fit of the garment. NB There is a 30 second delay before your breathing frequency appears. This is because the respiration signal requires measuring over a much longer time period than the ECG signal. At 6 breaths per minute each breathing cycle would take around 10 seconds. The optimum period to obtain a reliable estimate of the breathing frequency is around 3x the breathing cycle length or 30 seconds. From the hub, tap < START ACTIVITY > and choose an activity. The app will count down 3, 2, 1 and your session will begin. Each activity has a slightly different set of measures and insight, for example, indoor activities (like the one in the image below) do not capture GPS data. For a full list and definition of the measures and insight available, go to Measures and Insights. (i) The app is open and the brain is within range. (ii) The app is open but the brain goes out of range. (iii) The app is backgrounded or the phone is locked. 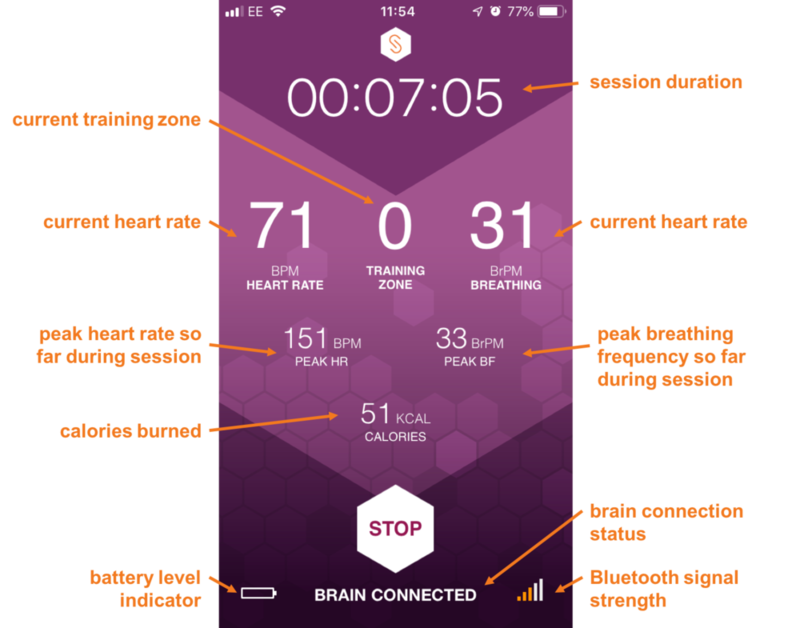 In the last two scenarios, as long as the brain reconnects with the app at the end of a session, the heart rate and breathing data logged on the brain will be synced. Smartlife is not able to recover data if the app is terminated or the brain runs out of battery during the session. Tap STOP to end your session and choose SAVE from the menu. Enter a name to identify the session and any notes (optional) then tap DONE in the top right corner to take you to the session summary. Go to my.smartlifeinc.com and log in with your app user name and password to view and download session data from your computer.